Remember the NCLEX? That beast of an exam you took right after your nursing program? I remember taking mine, though that was more years ago than I care to admit. I studied and studied and studied for that test because I knew it was so important. Thankfully, I passed. I’ve often thought about how happy I am that I studied so hard. Because while there’s not much I use directly from the test on a regular basis these days, when I went back to school, I found myself recycling many of the study strategies I created all the way back when. If you’re in Ashworth’s RN to BSN online program, you might not be studying for any exams, but you probably are doing quite a bit of schoolwork. Some of the strategies that came in handy for the NCLEX could help you now. To get you thinking, here’s my advice as a former nurse and student. Just like passing the NCLEX, succeeding in an RN to BSN program takes work. The worst thing you can do is wing it. Take the time you need to prepare for your coursework, including all the reading you’ll have to do. Make a plan that factors in all your school, work, and family responsibilities. Then write it down. This will help you keep your sanity while getting everything done. Everyone learns differently. So, if you haven’t figured out what works for you yet, start thinking about it now. Are you more of a visual learner? Do you learn best when you hear something out loud? Think about what kind of environment is a good fit for you as well. Will you find studying in a coffee shop invigorating or distracting? Do you need to set up an office at home to find your study groove? Another factor to consider is the time of day you learn best. Some people learn better in the morning and some are night owls. And, some are so busy that they just have to squeeze in studying on their breaks or while they’re waiting to pick up their kids! No matter what, think about what worked in your nursing exam prep days and personalize your study sessions. Just like studying for the NCLEX, sometimes school can feel overwhelming. Leaving all your studying until your day off is only going to feed this feeling. One of the best ways to make a goal manageable is to break it into smaller pieces. So, set time aside every day, or at least a few days a week, to get your studying done. We all need support at some point or another. When you were studying for the nursing exam, you probably had other people quiz you or go through flashcards. 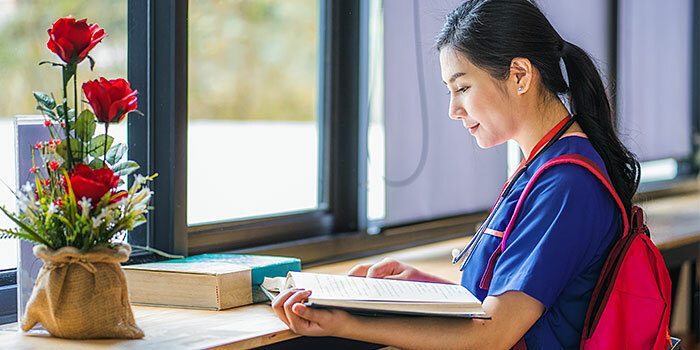 Your approach might be a little different now that you’re in an RN to BSN online program, but the general idea is the same. Especially since you’re not going to a physical classroom. Being an online student can sometimes feel like you’re on your own, but there are plenty of people in your same position. Use the student community to reach out to other students with questions or to see what approaches they’re finding helpful. Plus, you can always reach out to me if you get stuck or have questions! Sandra Kleiman brings to Madison School of Healthcare the knowledge and experience of a practicing nurse and an educator with a passion for teaching. Sandra's nursing background includes oncology, neonatal intensive care, emergency room case management, utilization review, denial and appeals management, correctional health, and nursing education. She earned her Bachelor's of Science degree in Nursing with honors from Chamberlin College of Nursing and a Master's in Nursing Education from Western Governors University.